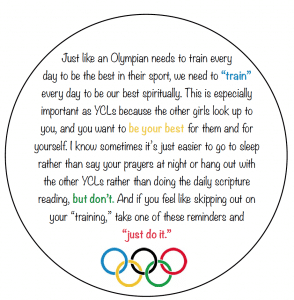 Today continues my posts about my experience at young women’s camp last week. 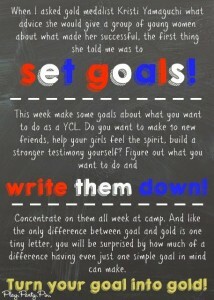 Yesterday I wrote about our Go for the Gold theme and how we incorporated the theme into every day. 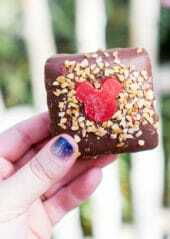 Today is all about one of my favorite parts of camp – girls camp pillow treat ideas. 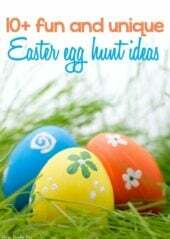 I’ve included all of my ideas as well as free printables for you! 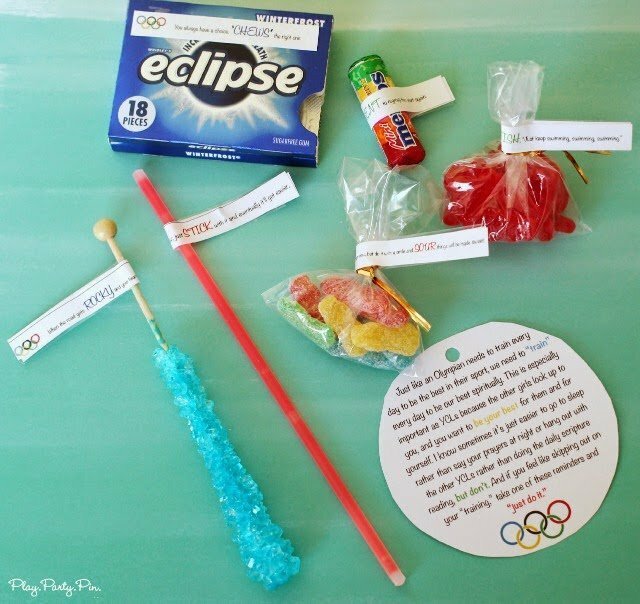 These could easily also be used for a handout for a lesson on Sunday or a mutual activity as well. Since I’ve been working on a stake level rather than with an individual group of girls, the past two years I’ve kind of adopted the YCLs (youth camp leaders, ages 16-18) as my own girls and surprised them each night with cute treats on their pillows while they are off doing other things. It’s seriously one of my favorite parts of camp because I love giving the girls a little something to thank them for all of their hard work and to help them know how much I truly love and appreciate them. We seriously have the best group of YCLs. They blow me away with their testimonies, example, and enthusiasm all throughout camp. 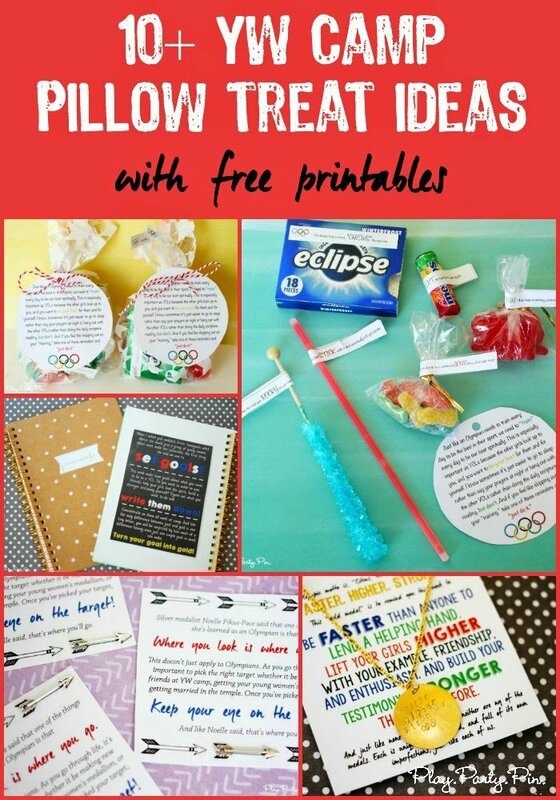 This year I went all out when it came to pillow treats and came up with four fun ideas based on our Go for the Gold theme and one specific to the Come Unto Christ scripture that I’ll post about tomorrow. And let me be clear, when I say pillow treat, I don’t actually always mean a “treat,” I just mean a fun little surprise left on their pillows. I like to mix it up with actual food and things the girls can keep. 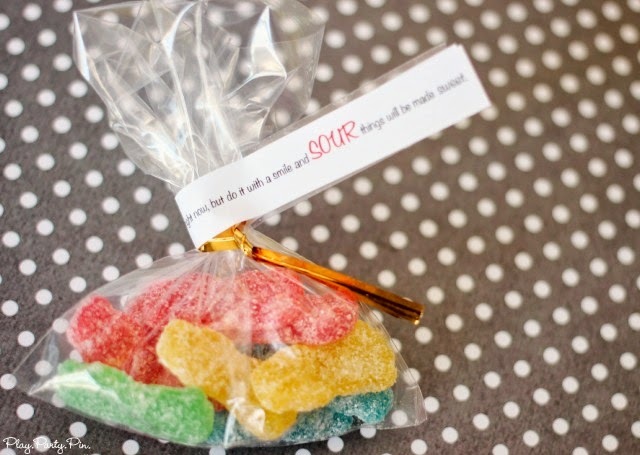 Since I’m working with the YCLs, I also like to try and use quotes and ideas about leadership and ways the girls can be better YCLs rather than just things like, “Here are some hugs and kisses because I love you.” I tried to do the same thing with last year’s Dr. Seuss themed treats. 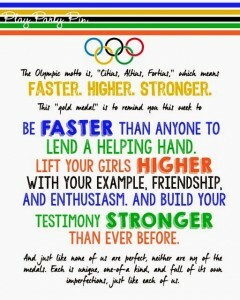 The first day our daily theme was opening ceremonies, and the pillow treat for that day was based on the Olympic motto – Faster, Higher, Stronger. 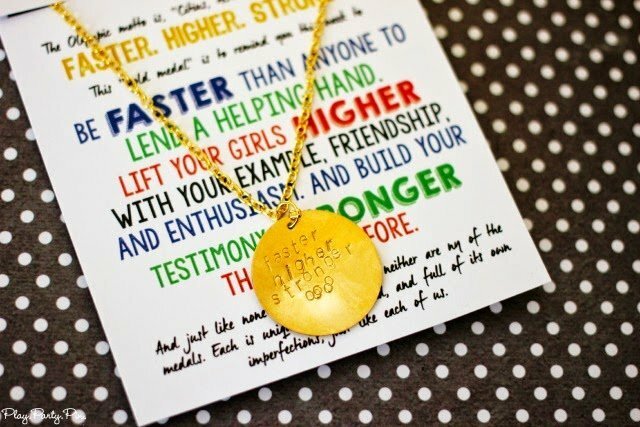 I used this tutorial and a metal stamping set I purchased from Pick Your Plum to make the girls gold medal necklaces with the words, “Faster, Higher, Stronger,” and the Olympic logo on them. 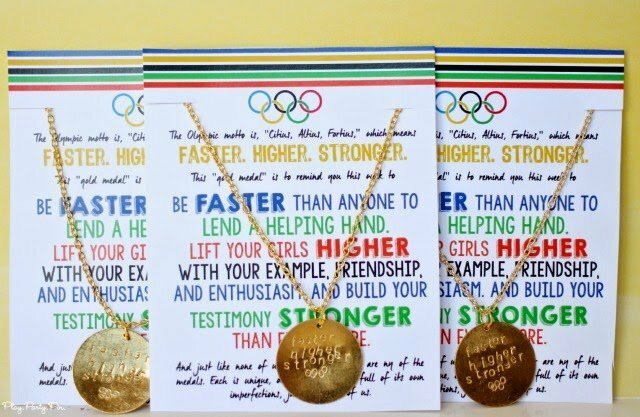 I attached the necklaces to a card that explained the Olympic motto and asked them to, “Be faster than anyone else to help out,” “Lift their girls higher with their example and enthusiasm,” and “Build their testimonies stronger than ever before.” I wish I’d had a little more practice with the metal engraving but other than that, I pretty much love how these turned out. And it was so fun for me to see the girls wearing the necklaces and/or charms throughout the week. The second day’s theme was get a good start. 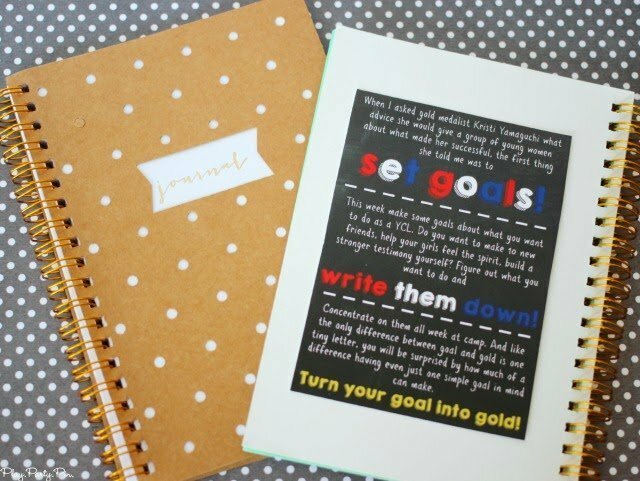 I created a notecard for the girls to remind them to make goals for the week, to write them down, and to turn those goals into gold throughout the week. 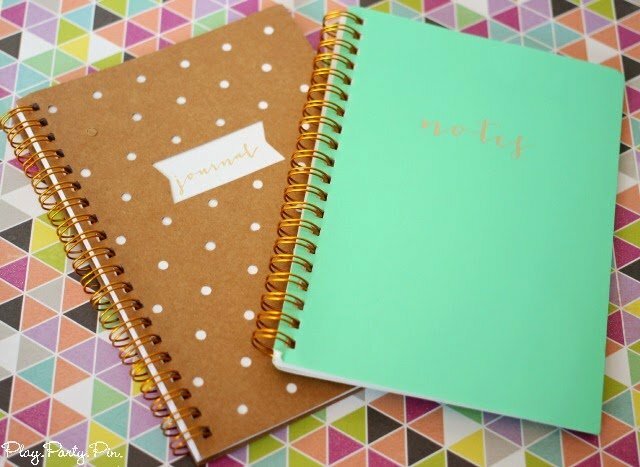 I taped the notecards inside of a journal and gave each girl a journal and pen to go with it. The third day’s theme was daily practice and training. I picked up some actual treats for the girls and put them into a bag, wrapped up and tied with a note about doing things each and every day even when they didn’t feel like it. 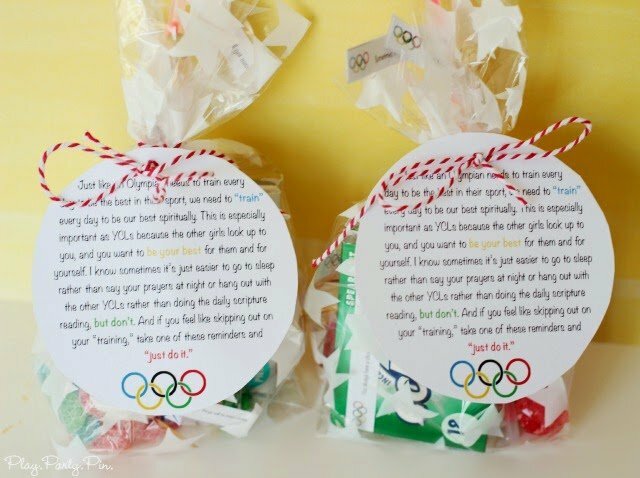 Inside the bag, each of the treats had a little corny tag reminding the girls to keep going. Things like, “sometimes it’s hard to start something new, stick with it and it’ll get easier,” taped to a glow stick, and “from the mouth of Dory the fish, just keep swimming, swimming, swimming,” taped to a bag of fish. 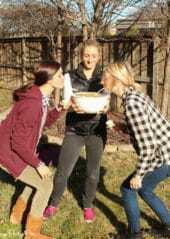 The fourth day’s theme was getting back up when you fall down, and I created a Come Unto Christ Cup for the girls. That in itself is a post of its own, so make sure to check back tomorrow for all of the details. The final day’s theme was keep your eye on the target. 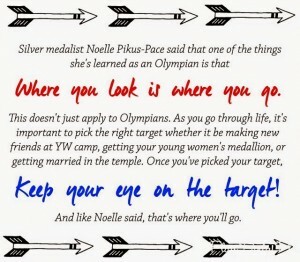 I created a little handout for the girls using one of the quotes from Noelle Pikus-Pace’s talk at SNAP, “Where you look is where you’ll go,” and reminded the girls to choose their goals and keep their eyes on the target at all times. 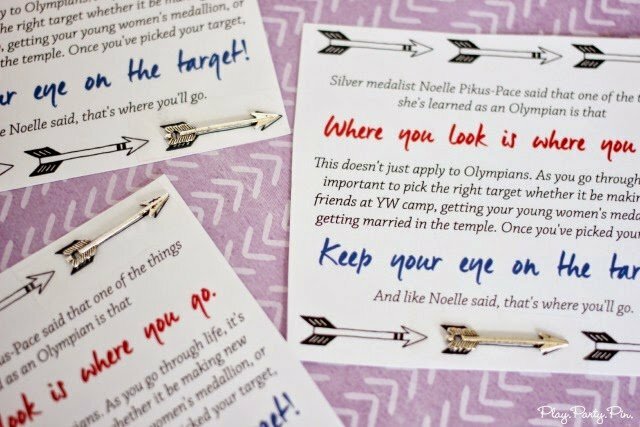 With the handout, I included a little arrow charm and on the back I taped a Target gift card. 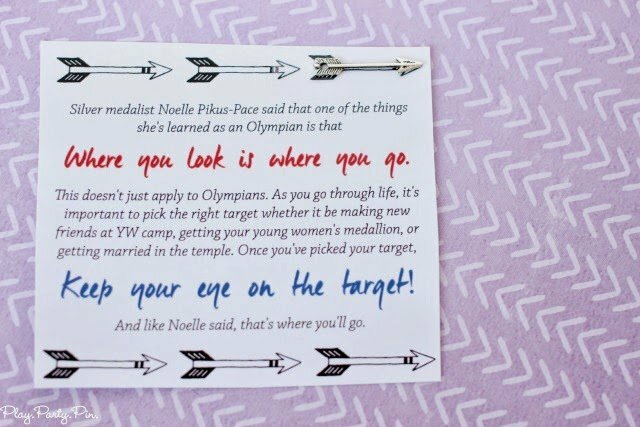 Since it was the last night, I stayed up until about 4AM writing personal notes to the girls (on cute arrow cards!) thanking them for all of their hard work and just put the handout inside the card. You could easily just use the handout, or the handout with the charm, but I wanted to do something special for the girls because they did such a fantastic job, and I thought the combination of the handout, letter, and gift card did just that. If you like any of these ideas, I’ve included free printable versions of these handouts below. There’s also a generic girl version as well if you’d like something not for YCLs specifically. Enter your first name and email address below to get these free printables. If you do not see the form below to enter your email, please click here to get to it. After submitting the form, you will be taken directly to the printable PDFs. Use the back button in your browser to return to this page. Love, Love, Love your ideas!!! Thank you for sharing all your hard work! I am struggling with ideas for the opening and closing ceremonies. Would you mind sharing the specifics and outline of what you did? For opening each of the levels were assigned a country and we had them design a flag together (during a pre-camp or earlier that day) and run in and do a little song that was dedicated to their country. We then introduced our overall theme and briefly talked about the conference talk about what you’ll do with your 4 minutes and how it tied to our overall theme of Coming to Christ. For closing ceremonies, we had each group run through and sing their quick song again (they used it as roll call all week) and then handed out awards and certificates, nothing fancy. Both were pretty casual affairs! 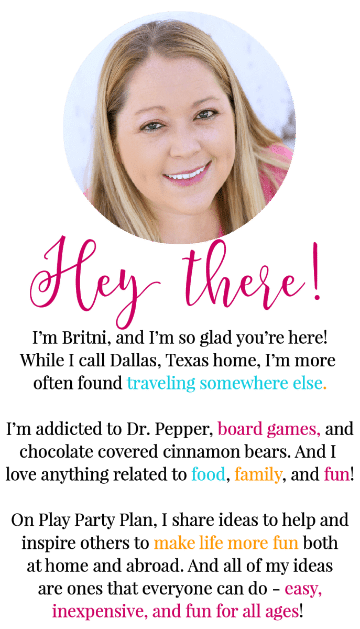 Thank you so much for sharing your wonderful ideas and printables. I am the assistant over YCLs and we have the same theme! Looking forward to giving these great pillow treats to the girls next week. Thanks!!! Shel, I used the font Noteworthy for the daily practices handouts. You are amazing! Thanks for sharing your ideas!